I regularly run styling workshops in partnership with both up-and-coming and established Dubai-based interiors brands who want to reach their customers in a fun and interactive way. Usually taking place over a few hours directly in a brand's showroom or store, these themed live events give attendees not only my top tips on home styling but practical advice on how to use these to style their own pad - all my workshops are highly hands-on and let invitees apply their newly learned skills during the session using the brand's own products. We've partnered with IDdesign & Expat Woman to bring you an exclusive workshop event! Hosted by yours truly, this workshop will showcase some tips and tricks on how to decorate one room in two different styles. Spots are limited so be sure to register your place soon! When Bits&Pieces got in touch to ask me to run a little workshop in their store for an intimate group of Dubai bloggers and 'influencers', well, I didn't mess around and basically went ALL OUT with the most colourful pieces they have in their collection, to style the boldest yet fun festive table settings possible. We had a fabulous morning looking at how much fun you can have decorating your table for the holidays, as well as the art of finding the perfect gift (for those who have everything and need nothing!)... We finished off the session with some clever tips to wrap your presents like the pros (3 words, people: DOUBLE-SIDED TAPE!). Read the full blog post here. 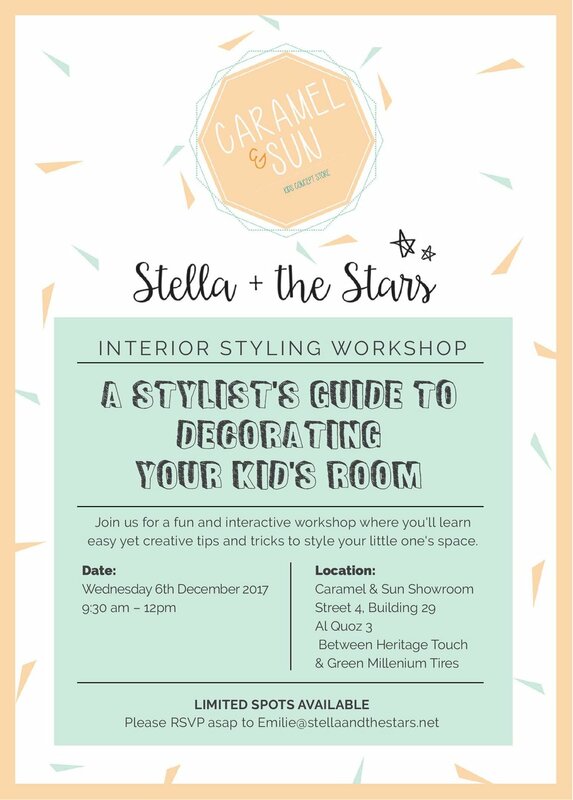 Join us for a fun and interactive workshop in collaboration with Dubai's coolest Kids concept store Caramel & Sun. You'll learn easy and creative tips to style your little one's space and will be able to apply those tips on the day with your own kids corner to style! Fill out the form below to sign up! The workshop is free to attend but we only have 15 places available so RSVP is essential to secure your place. Thank you! We will send you an email shortly to confirm your attendance. Look forward to seeing you at the workshop.